Having a business budget in place is an essential part of running a business. Whether you're launching your first business or have years of experience as an entrepreneur, the importance of having a budget cannot be overstated. Creating a budget for your business will provide a guideline for expected income and expenses and enable you to compare your anticipated financial goals with the actual numbers. In essence, it will serve as a barometer for how your business is performing. It will also enable you to plan ahead and determine any changes that should be considered. A budget can be created in a way that is most comfortable for you. You can use pencil and paper, a computer spreadsheet program or business accounting software. While you may also choose the time period (monthly, quarterly, annually) the budget may encompass, consider creating a monthly budget so you can compare the forecasted numbers with the actual numbers at closer intervals. Input unchanging expenses such as rent, loan payments or pre-paid costs for "Fixed Expenses" and changing expenses such as utilities, supplies, etc. for "Variable Expenses." Determine budgeted expenses by averaging past expenses in each category. Insert the figures under the "Budgeted" subheading for expenses. If you are in the midst of starting your business and don't have previous averages to work with, consider researching the costs associated with your line of business and creating averages based on your research. Next, insert your forecasted income from earnings and any other expected revenue sources under the "Budgeted" subheading for "Income." 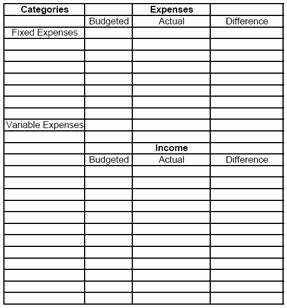 At the end of the month, insert your actual income and expenses in the "Actual" columns. Finally, calculate the difference between the budgeted figures and the actual numbers. Place the figures in the "Difference" column and determine if your budget was in line with your actual numbers. If not, it is important to identify why the actual numbers varied from the budgeted figures, regardless of whether you incurred more expenses or income than anticipated. By determining the reason for the difference, you can either identify a potential problem and fix it or capitalize on a potential opportunity you had not initially recognized. After determining the reasons for any differences, revise the next month's budget with your new-found information in mind. Remember, it's important to remain agile and make changes to your budget as needed. Adjust accordingly. During these tough economic times, entrepreneurs may be seeking ways to trim expenditures to increase cash flow. If your business expenses need to be reduced, determine which items are nonessential to your business and cut those items. Consult a professional. Consider consulting a trusted CPA, financial advisor or banker to help you create a budget. A trusted professional can help get you started on a budgeting system that will work best for your individual needs. Having a business budget in place enables you to plan ahead, prioritize your allocation of funds and gauge whether your financial predictions are being met. It will also enable you to make educated decisions to enhance your business operations with added clarity and efficiency.